PSC Senior English School is a renowned Institution, (in Virudhunagar District) which functions under the Central Board of Secondary Education, New Delhi. We follow the CBSE policy in admitting children to school. Admissions are finalized in the month of March. To be admitted to L.K.G, a child must be atleast three years old. Pupils meant for admission must be introduced personally by their parents or guardians, who are responsible for their regularity, punctuality, good conduct, in addition to paying fees on time. Application forms can be got from the office on payment. They should be submitted along with the Birth Certificate in the office. Has been studying in a school recognized by or affiliated with CBSE or any other recognized Board of Secondary Education in India. Has passed an equivalent qualifying examination making her eligible for admission to the class. (i)The school leaving certificate / Transfer Certificate signed by the Head of institution last attended and counter signed by the Educational Authorities. (ii)Documents in support of her having passed the Qualifying or Equivalent Qualifying Examination. (iii)Birth Certificate issued by the Registrar of Birth and Death, as proof. 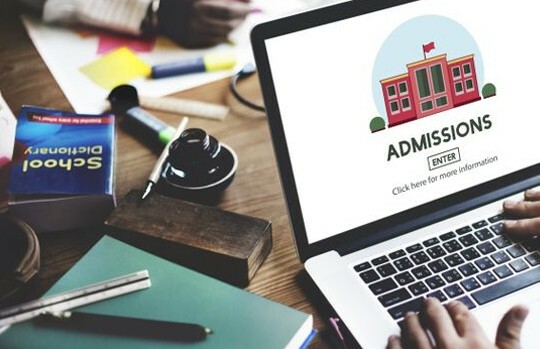 A student migrating from a school in a foreign country, other than the school affiliated with CBSE, is eligible for admission if an eligibility certificate in respect of such a student has been obtained from CBSE. Admission upto Std VIII will be regulated by the rules and regulations, orders of the State / Union Territory Governments. (i) Admission to class IX will be open only to the student who has passed class VIII Examination from an institution affiliated with CBSE or any Board recognized by the Education Department of the Government of the state with a pass mark in a third language. (ii) No student will be admitted to class IX after the 31st of August of the year except with the prior permission of the chairman, CBSE. Admission to class X will be open to a student who has completed a regular course of study for class IX and has passed class IX examination from an institution affiliated with CBSE. Student who is under the sentence of rustication, who has been expelled from any school or debarred from appearing in the examination, will not be admitted. For all admission related queries, kindly contact the school office and check out the exact dates of issue of the application form for registration. The prospectus and the registration forms should be collected in person, duly filled and handed-over at the school office. Registration for admission does not guarantee a seat. Admission is granted based on the vacancies that may occur during the academic year.